One of the thrills of pursuing vintage is learning about different styles and the history behind pieces. My undergraduate degree is in theatre arts (talk about supportive parents!) and then I came back to reality and got a Master’s in education. I can definitely see cross-over in my theatre arts studies with design, but I have no formal training in interior design, art history, antiques, etc. I learn as I go, and that’s half the fun. Last week I picked up these amazing chairs. I knew when I saw them that they were fantastic, but what should I call them besides “rattan”? And then I found similar chairs labeled “Brighton” or “Brighton Style”. So, what the heck is Brighton? I had to find out. I’ve done a lot of European traveling, but have never been to England. Perhaps if I had, I would have known this already. Brighton, or the Royal Pavilion, is a former royal residence, primarily associated with George IV (1762-1830) and located in Brighton, England. “The Royal Pavilion is also home to some of the finest collections and examples of the chinoiserie style in Britain” (Brighton website). Note the Indo-Saracenic style of the building’s architecture. The dining room features panels adorned with Asian figures. The Long Room is covered in pink chinoiserie! You can barely see the “Brighton style” chairs just past the fireplace. Another look at the Long Hall, in all its pink and gold glory. Even the kitchen has chinoiserie decor – exotic “trees” and a pagoda fireplace/oven. 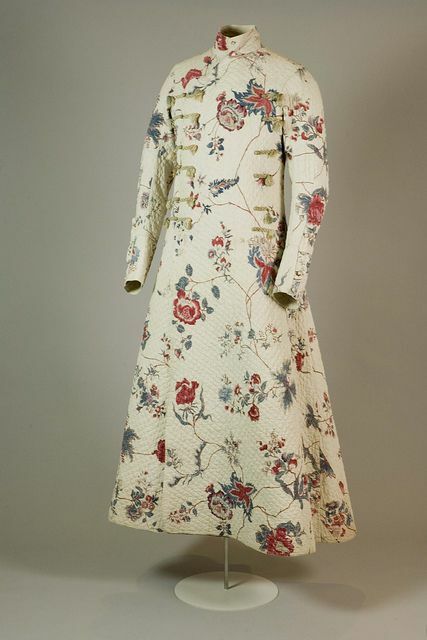 I know several women who would love a robe like this – but it is made for a man. See the close-up detail below. There is a lot of interesting history associated with Brighton – more than I can go into here. But I encourage you to take a peek at The Royal Pavilion, Museums & Libraries website. I know the Royal Pavilion will be added to my bucket list! I’d love to know if you’ve been to Brighton, and your thoughts! What a great post. Thanks for education me a bit more on England…one of my favorite places! One more site to visit on my next trip across the pond.